My father, Ulrich B. Jacobsohn, M.D., passed away last week. He was a brilliant psychiatrist, my hero and my inspiration to be a timebanker. Through his stories, I learned about the world. He loved this country, arriving in 1948 from Bangkok, Thailand. 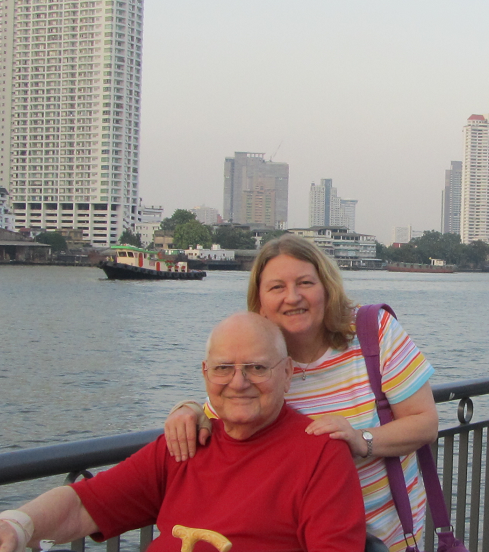 How he got to Bangkok after being born in Berlin, Germany, in 1928 is a fascinating tale of luck and valor that I am putting to paper as I stop to write this blog. I see it as ideas branching out from the tree of his life. Family is everything if you see everyone as family; that is what my father did, and it is his legacy to me. The Japanese invaded and occupied Thailand the day after Pearl Harbor, but no one paid much attention to that in America. My father, thirteen years old, later watched the bombs fall on Bangkok that disrupted the Japanese use of Thai resources and he applauded, though in fear for his life. He revered the Americans, learning American songs on the radio and reading books about America. Someday he would live there as an American, but it took many years to be accepted, being “half-Jewish” (whatever that means!) and of German (Nazi!?) heritage. Finding community was a constant journey for him. He wasn’t just born with a helping gene (though he was a 7th generation physician); he learned at an early age the value of community, having gained and lost it several times. He considered kindness to be second nature and a critical element of survival. The other critical element is wisdom, and he passed a lot of his on to me. The wisdom was, intend kindness. It is good. His experience living in Thailand, where he was treated with kindness and respect during his formative years, carried on as a theme in his life. He loved the Thai people, always smiling, always helpful. As a child, I think he recognized his purpose as a healer, that he could take what he knew about human nature and somehow help the situation—lord knows, there was a great need for healing and kindness everywhere, just as there is now. As a medical student, he became fascinated with the diagnosis and treatment for psychic wounds in veterans, or what we now call PTSD (Post Traumatic Stress Disorder). He understood it because he had the same symptoms. In healing them, he healed himself. I traveled with him in 2010 back to Germany, where he visited the concentration camp he would have been sent to if caught in 1933. He contemplated his fate in front of the gallows, finding a measure of peace. My dad took every opportunity for growth in the profession of psychiatry, not for money, but to put himself in a place to make system changes. Serving as a staff psychiatrist for Camarillo State Hospital (“Hotel California”), he asked a nurse why patients were getting cold showers. Her answer was, “That’s how we’ve always done it. I’ve been here for thirty years.” He knelt down in his 3-piece suit and found that the hot water valve was never connected; just one small part was missing. He called the maintenance department, and patients had hot showers again. People can become numb to the most egregious things and forget what their values are. It takes a leader like him to hold the space for kindness. He held his staff to higher values, never punishing them for speaking out as a whistleblower, always encouraging them to continue to learn. He approached life as a student with simple kindness and respect as his beacons. He infected everyone he met with kindness. I mean to do the same. One snowy day in 2013, he had a severe stroke, alone in his cottage in an assisted living community. His expensive “Life Alert” pendant lay in another room after he forgot to put it on. His phone was on the side of the stroke; even if he had the logical thought to use it, he was unable to reach it. The convenient pull cord above his bed lay still, unused, for hours. Because he was loved, he was saved. His neighbor across the street looked out for him, and noticed that his newspaper lay unclaimed in his front doorjamb. Concerned, she called the front desk and asked them to check on “Dr. J.” She was modest when I thanked her for saving my father’s life. They were friends. She cared about him. But would she have done such a thing if he was always a jerk to her? Would she have watched his house so closely? I think not. That is the power of peaceful neighbors. The power of violent neighbors is also quite evident; just look at the judgements every day made about neighbors in poverty, or people of a different color or ability. The rise of nationalism, racism, fascism, unbridled capitalism—and all violent intent aimed at hurting others, threatens our very existence. What could possibly be worth killing each other to preserve it? It is not enough to want peace wistfully; one must actually value it as if one’s life depended on it. It does. We have to do something to promote good will in this country and the world, if peace stands a chance in the swirl of war. I don’t mean just war in the Middle East. I mean war against our neighbors, just as it began in Germany, by asking this senseless, useless question: “Who is to blame for our troubles?” That is where it begins, when we think of our neighbors as the other, and not family. Inequality does not have to be reality. To be peaceful, the economy has to work for everyone. We invented money; it is a social construct. We must remember the shortcomings of our money system, especially its basis in short-term, violent perspectives. I am looking to the long-term prospect of living with each other in peace. When timebankers say some things are not about money, we mean money the way it stands now. It could change, if we socially constructed it. Joining the Timebanking Movement is a path to peace and kindness, a tool to tangibly value all the things that aren’t about money: acceptance, community, kindness, trust, and mutual aid. Timebanks weave the fabric of a peaceful world. It can, and must, be our intention to hold some things dear and, if not a full transformation of our money system, to build a duel system to measure and promote the things we truly value. One beautiful night in 2010, a friend and I had supper with my father and Edgar Cahn, the “Father of Timebanking.” The two fathers had much in common, discussing the 60’s, the War on Poverty, the De-institutionalization of struggling souls living in facilities, the lessons learned of political expedience, of walking the talk and Co-Option. It was fascinating, and I will always treasure the memory of that meal, though I can’t recall what I ate. I hold the memory of my father’s life, and his bottomless kindness. I am connected to him, but I don’t do my work to make him proud. I do it because I agree that kindness is beautiful, because I yearn for connection, because kindness spirals and it pleases me to help it do that. I am thankful for the place I find myself in, a place where I belong, immersed in the Timebanking Movement. Thank you, Dad, for leading me here. You treated us all like family. You can read more about my father’s extraordinary life HERE. Stacey Jacobsohn is the Founder and Executive Director of Time Initiative of Maine (T.I.ME). I want you all to know that if it wasn’t for my doctors office telling me about the timebank 3 years ago, I really don’t think that I would be alive today!!! I was going though a very bad time in my life. When I did join the time bank they looked at the person inside and gave me a feeling of self worth; the biggest thing is that I can be who I am. I thought that I had nothing to give the world, but I found out a lot differently with the time bank. Every day since I have been a member, I have learned so much more that I can do to help other people that need help. I truly owe Dr. J and Stacey for what they have both taught me–that we are all born with special gifts inside us. I read this and at first I wanted to cry because I knew Doctor J, however I soon found my self smile and then laughing because I knew Doctor J. I am a member of the T.I.ME Initiative of Maine and so I was blessed to have spent several holiday parties at his house and remember his warm smile and deep expressive eyes that seem to see into your very soul. His laughter was contagious and he had you wanting to know more about what ever he was discussing. The most outstanding thing about this remarkable man was he inspired trust, I felt like I could tell him anything and he would not only understand he would accept me no matter what. When Stacey went with her aging Father on his final trips to Thailand and Germany she would send home reports of how her Father was doing as he came face to face with his childhood memories and worked through so many of his fears as he saw them through the eyes of a man who had spent his whole life as a healer of others. When they returned from his final trip he was home a very short while before his stroke. All of us who knew him from the TimeBank were very sad at what had happened to this intelligent vital man who gave so many of us such fond memories of those wonderful Holiday Gatherings. I had the opportunity over the next few years to visit with him at the Veterans Home where he resided a few times and despite the fact he had lost most of his speech you could still see the compassion of the healer in his eyes. I watched him listen to one of the other residents and hold her hands as he looked into her eyes while she told him all of her problems and he needed no speech to convey to her that he understood; he was always the healer. TimeBanking is a wonderful way to join with others as a Community so we can support and encourage each other while learning the value of ourselves and others in our community and the world around us. A world that is not based on money is new to most of us and sometimes hard to understand at first, the one thing I know for sure is that Doctor J lived his life treating others with compassion and the understanding that reciprocity was the glue that binds us together as a community. I know I am a much richer person with a better understanding of TimeBanking for having had the chance to get to know a truly remarkable man.